In 1997 Ibex Outdoor Clothing opened shop in Woodstock, Vermont, as a specialty manufacturer of high-quality wool clothing, especially outerwear and insulation for outdoor use. This is part 4 of an ongoing series profiling outdoor gear companies in the Northeast. Over the past 12 years, the company has expanded rapidly and antipodally, though it remains headquartered in central Vermont. (They have since relocated 14 miles to White River Junction, having outgrown their original warehouse space.) According to their web site, Ibex initially sourced and manufactured their products in Rhode Island—but has since found softer, higher quality merino wool from sheep farmers in New Zealand. Founder John Fernsell says: “I started Ibex because, as a cross-country skier in the 70s, the wool I wore performed so well. Synthetics made me sweat like a gorilla.” And so there you have it. Wool does perform well as an insulating layer, especially since it maintains much of its warmth even when damp or wet. It also breathes well and holds up to years of use. Plus it comes from cute little sheep instead of petroleum. Ibex prides itself on the quality and sustainability of its wool—read more about it here. I would describe much of the Ibex line as day-to-day, all-purpose, around town kind of wear—excellent for cool to chilly conditions. 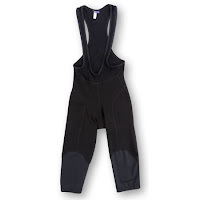 They make a full range of men’s and women’s jackets and other insulating layers, but perhaps most compelling is their line of merino wool base layers, including specialty items designed specifically for cold-weather cycling, like the El Fito 3/4 Bike Knickers ($125; pictured) and El Fito Bib 3/4 ($145).